Well, if March hasn’t been the windiest month of the year so far, it at least produced some good fishing. Slight drops in the temperature put our angling knowledge to the test in order to keep the rods bent. 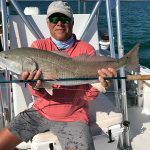 The first half of the month, being warm and mild, produced some great flats fishing for trout, catch-and-release redfish and snook. The last half of the month, being cooler than normal, made live shiners hard to come by, but opened the door for the tail end of the sheepshead bite. And now it’s April and, no fooling, fishing is great. The daytime temperature is on a steady rise into the 80s by afternoon, although the overnight temp is dropping into the low 60s. Catch-and-release snook and redfish are still being caught, just not with the vigor of those warmer days of early March. Also, a large influx of sardines, glass minnows and threadfin herring in Tampa Bay is producing some great action on Spanish mackerel, ladyfish and jack crevalle. And don’t go snubbing your nose at those fish, because when you’re looking for action, these are some of the best candidates you’ll find. They are available throughout Tampa Bay and they will up one heck of a fight on light tackle. Fishing offshore is falling into place. Blackfin tuna are being caught, as well as kingfish, a few pompano and numerous groupers and snappers. Permit are being found by those dialed in on that bite. Plus, rumors of cobia are drifting through the charter boats. On my Southernaire fishing excursions, I’ve been concentrating on catching sheepshead, especially when my clients are looking to bringing home dinner. With a shortage of live shiners in the area, this bite is handy because the sheepies like shrimp. They don’t eat shiners. Bottom fishing for the buck-toothed fish also is yielding Key West grunts, mangrove snapper and a few flounder. 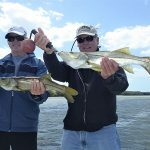 On days when I have clients looking for action, I’m putting them on a variety of fish, including catch-and-release snook and redfish. Spanish mackerel and jack crevalle are good options for sport fishers. These fish are where it’s at when it comes down to action. Jim Malfese at the Rod & Reel Pier is seeing a variety of fish being reeled up by visiting anglers. Sheepshead are available for those using live shrimp as bait, which also is working well for black drum, flounder and an occasional catch-and-release redfish. Spanish mackerel are frequenting the pier now that an abundance of sardines and glass minnows are present. Swift-moving tides are causing these schools of baitfish to gather around the pier, which is attracting the macks and jacks in numbers and some ladyfish. Casting small white or pink jigs will get you connected to these fish. Lastly, catch-and-release snook are making a showing at the R&R, although only a few are taking the hook. Capt. Aaron Lowman is finding a good trout bite over shallow grass flats in Tampa Bay. Free-lined shiners or shiners under a popping cork are producing good action on trout for his clients. Swift-moving tides and clean water are major factors on the flats. Catch-and-release snook are providing good action on grass, especially where oyster bars and mangrove shorelines exist. While targeting the catch-and-release snook, Lowman is seeing a few catch-and-release reds in the mix. Lastly, targeting catch-and-release gag grouper over shallow structure in Tampa Bay is resulting in some hefty catches and worn-out clients. Capt. Warren Girle is venturing out to the nearshore ledges in the Gulf of Mexico on days when the seas are calm. In depths of 40-55 feet, he is finding kingfish in good numbers. Free-lining live shiners on a wire rig is attracting kings up to 20 pounds for his anglers. Also while on the ledges, he’s bottom fishing with shiners, which is yielding his clients plenty of mangrove snapper and Key West grunts. While fishing inshore on the flats of Sarasota and Tampa bays, Girle is finding success with spotted seatrout, Spanish mackerel and catch-and-release redfish and snook. Capt. David White of Anna Maria Charters is running groups offshore for a variety of species. Red grouper and mangrove snapper are being caught with regularity. Kingfish also are making a showing. Dropping live shiners or frozen sardines to the bottom on ledges and other structure is yielding a bite. Also while offshore, White is finding such migratory species as blackfin tuna and African pompano for the coolers. Moving inshore, catch-and-release snook and redfish are being caught along with spotted seatrout and Spanish mackerel. Capt. Jason Stock is producing results for his clients by targeting blackfin tuna in the Gulf of Mexico. Both artificials and live bait presentations are working to hook these speedy fish. A tuna will drop a spool of line quicker than you can blink an eye, which is excellent action for Stock and his clients. Blackfin also is excellent on a sushi platter. Permit action also is on the rise for Stock. Tossing live crabs around offshore wrecks is resulting in fish up to 20 pounds. Lastly, Stock says live shiners free-lined behind the boat around offshore structure are attracting kingfish. 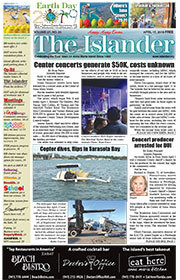 Send high-resolution photos and fishing reports to fish@islander.org. 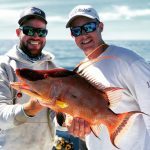 Saltwater Fish Life List: Can you catch all 70 species? 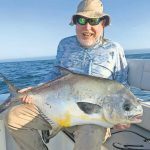 Saltwater Reel Big Fish: Recognition for extraordinary-sized catches. Saltwater Grand Slams: Earn rewards for catching three specific fish in 24 hours. Anglers also can join the new Triple Threat Club and earn even more prizes — including a long-sleeve performance fishing shirt and a chance to win a weekend getaway — by participating in all three programs. Anglers must have at least one application approved for each program to qualify. The FWC also manages the Florida Saltwater Fishing Records program. For more information, go online to CatchaFloridaMemory.com.